Obviously the name of the game is striking but watching the pins jump around like a grenade just went off is one of the most exciting aspects of bowling and for that, consistency is needed. If you’re like the many bowlers out there you’ll quickly notice the people with the high averages and perfect games can make bowling look so easy. But why? These bowlers understand the key fundamentals of the game. Letting the ball do the work. While we can’t just roll the ball down the lane and expect great results, we can use technology to our advantage. That’s where a proper release comes into play. In order for the weight block in the ball to really function how it should, a bowler needs to practice their swing. Once a comfortable, pendulum swing is established accompanied by proper footwork, we can begin the release. Let’s go over a few basic areas. Ideally you want to find a target area on the approach lane and choose a target out on the lane then walk in a straight line towards that target. Walking straight will improve your consistency. A high backswing is not for everyone… I find the majority of bowlers will strike more consistently if they never bring the ball up higher than their shoulders on their backswings. Keep your wrist straight on your backswing and comfortable. Trying to open your hand to achieve more rotation at release will more than likely lead to failure. Come back straight. When the ball passes your ankle on your forward swing, your wrist should be approaching the handshake position. Your thumb should leave the ball initially and smoothly while your index and ring fingers should “lift”. The timing of this is key to revolution and the about of side spin come from the angle your wrist is in at release. Practice different angles of your wrist at release and remember the power comes a smooth release just passed your ankles. A properly drilled ball WILL HOOK with very little effort if released in the proper position. Balls are designed to “flip” so there is no need to muscle the ball into hooking. If you aren’t able to repeat your shots, your game will suffer. Find an easy, comfortable swing, wrist position and release then see if you can repeat shots. Forget about where the ball ends up down the lane for now. Once you can repeat a shot, move your target on the approach and your targets downline until you find the pocket. 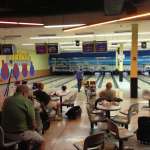 Although this is just a handful of things to consider, the most important aspect of bowling is consistency. You can throw the best strike ball in the world and be an extremely poor bowler if you can’t simply repeat the shot. However, you can be an extremely consistent bowler and throw no hook at all yet be a very successful bowler. Combing the 2 is what makes a pro, a pro. Did you know you can manage your bowling ball hand layout and drilling layouts for all of your equipment? Give it a try and start tracking your game vs drilling differences. The same ball drilled in different ways can delivery drastically different results.